For all UK readers, I hope you've been enjoying the beautiful sunshine! As always though, the summer heat brings with it the usual challenges for hijabis. It's difficult to find tops that don't need layering, but instead of stuffy cardigans, here are a few high street finds to cover up over maxi dresses, skirts or sleeveless tunics. 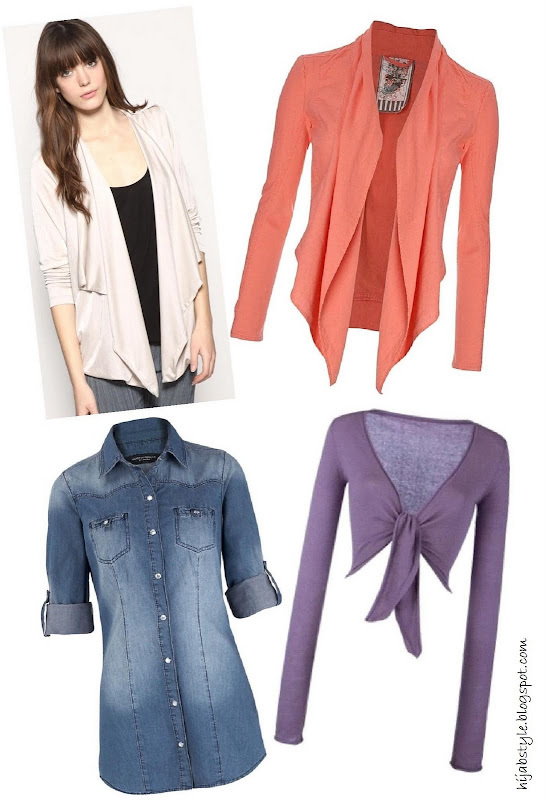 Try jersey cardigans or shrugs, or for a casual look, a lightweight denim shirt worn open is a more comfortable alternative to a denim jacket. Don't forget to share with us any other great finds you've come across! 1971 Reiss Freya draped jersey jacket £79, ASOS; Linen mix waterfall jacket £25, New Look; Karla top £22, Long Tall Sally; Blue denim shirt £28, Dorothy Perkins. what I find that really works are shirtdresses made of 100% real cotton. they are the most comfortable and keep me cool in the california sun. Anthropologie also has some great, light weight, mid thigh length cardis for summer in a variety of colors. I've also found that JCrew has a wonderful selection of tunics and shirt dresses for spring and summer. I'm not a muslimah but I enjoy reading Hijabi fashion blogs because I like the modest, feminine, elegant fashion suggestions that don't resort to over-revealing clothes to attract attention. Thanks for the inspiration and keep up the good work! You gals look so beautiful!! Great news after reading about the search for cool coverups for Hijabis we may have a solution. Hijabis all over the Gulf can now shop for modest clothing at their favorite US Retailer and get international shipping! Visa is pleased to bring you Borderlinx, a new service that allows most international shoppers to buy U.S. products directly from U.S. online retailers. Now you can shop at some of the haute-est U.S. retailers like Gap, H&M, Macys, Target, Sears, Walmart, and get the latest styles, products, and hand-bags shipped to you with Borderlinx, brought to you by Visa. Right now, get free sign-up and 10% off shipping when you use your Visa card. Check it out at http://www.borderlinx.com/visa. Shop, ship, share, save, and enjoy!